Since La Catrina is depicted as a Mexican who embraces European aristocratic traditions, they're appeared to wear European costume. However, they also have their face painted as a beautiful skeleton to celebrate Day of the Dead. 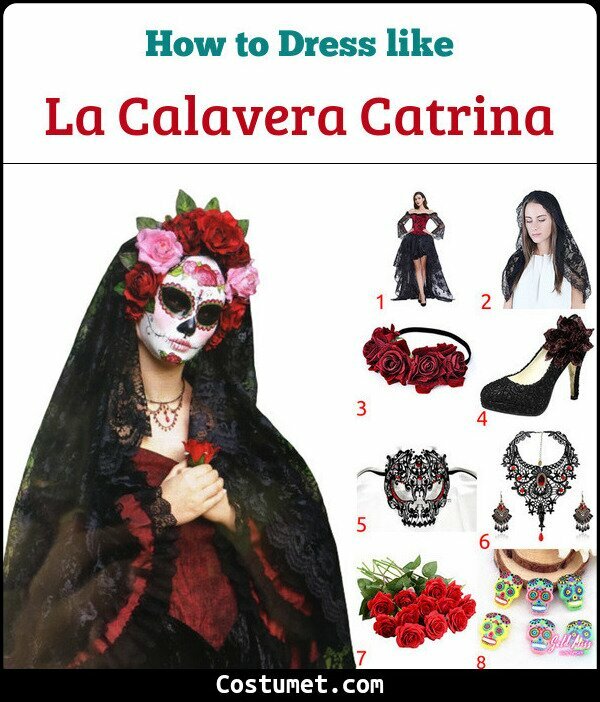 La Catrina wears a dark Victorian style dress, a black veil, a red rose tiara, a skeleton mask, a set of necklace and earrings, and black lace high heels. If you want to recreate this look, follow the instruction in our item list down here! 1 Black and Red Victorian Dress Get a long black and red Victorian dress to wear. 2 Black Lace Veil Cover your hair with a black lace veil. 3 Red Rose Headpiece Wear a red rose headpiece. 4 Black Lace High Heels Match up your dress with a pair of black lace high heels. 5 La Catrina Skeleton Mask Instead of dealing with make up, get yourself a La Catrina's skeleton mask. 6 Red Necklace & Earrings Costume Put on a red jeweled necklace and a pair of red earrings. 7 Rose Prop Holding a rose as a prop. La Calavera Catrina is a 1910–1913 zinc etching by the Mexican printmaker, cartoon illustrator and lithographer José Guadalupe Posada. The artist offers a satirical picture of Mexican people who embrace European culture in the pre-revolution era. However, as time has passed, La Catrina has also become the symbol of Mexico's most famous tradition Día de Muertos or Day of the Dead, which is a Mexican holiday where families will gather and pray to the friends and families who have died - respecting the ancestor by keeping them alive in the memory of the livings. Beside being an icon of the most celebrated festival in Mexico, La Catrina has also found its way into pop culture in all around the world. Skelita looks like a skeleton with a Day of the Dead-inspired makeup. She wears a simple black halter top, a multi-colored skirt, and lime green platform sandals. She also has long black hair with marigold streaks in it.